Home » News » Older adults: an overlooked ministry resource? Posted by Admin on Jan 31, 2019 in News | Comments Off on Older adults: an overlooked ministry resource? A lot of congregations have youth groups, but how many have their own older-adult ministries? 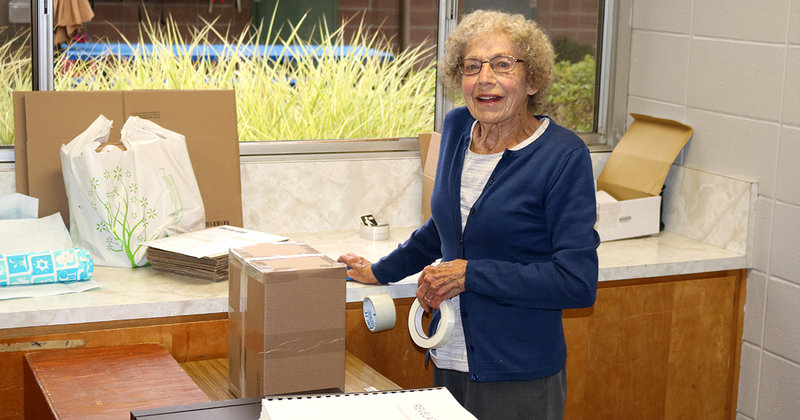 Not just to serve older adults, but to give them opportunities to serve. At Trinity Lutheran Church in Mission, Kan., members ages 55 to 95 attend Bible studies as well as meetings to learn about Medicare, preparing wills and other age-related topics. They also take part in “opportunities to be a blessing to others,” according to Tom Perry, 66, the congregation’s senior-ministry leader. Those service opportunities include packing “hand-up bags” for the homeless, Easter baskets for the homebound and “help sacks” for cancer patients. Trinity seniors sing Christmas carols at local retirement homes, and regularly call on fellow church members who can’t get out and about, offering them “a listening ear, a word of Scripture and prayer,” notes Perry. They also serve as readers and mentors for the congregation’s preschool and Sunday school students. Perry says he and his contemporaries are “anxious to give of ourselves so we can make a significant difference to our congregations, our families, our grandchildren and the stranger down the street. The Rev. David Meggers, associate for Adult and Older Adult Ministry at Concordia Lutheran Church in Kirkwood, Mo., agrees that ministries led by older adults are “very valuable,” but points out that few congregations take advantage of the contributions their senior members can make. If you consider the number of congregations that have a youth-ministry staff person, the number of those with a staffer for older-adult ministry “is pretty small,” he says. As part of Concordia’s “Ageless Generations Ministry Action Team,” older adults serve by visiting homebound members and residents of an assisted-living retirement home, volunteering with the church’s children’s ministries, organizing donated items at area food pantries and helping with crafts at Sunday school and vacation Bible school. What’s driving older-adult ministry right now, Meggers notes, is that some 10,000 Americans are turning 65 every day, and they’re healthier, more active and living longer than previous generations. So, he adds, congregations don’t have to wring their hands because they’ve got a lot of retirees — they should celebrate the fact that they have “a lot more servants” who “really want” to help! Because of the service of Concordia’s Ageless Generations members, worship attendance at the congregation’s midweek Lenten services has more than tripled, notes Jerry Witte, the group’s 70-year-old lay leader. The bump in attendance was sparked by “Soup’s On” lunches prepared by the Ageless Generations group and served after each midday service, from Ash Wednesday through Holy Week. As a ministry bonus, free-will offerings are collected and distributed to local charities. “The soup is combined with a lot of friendly conversation and great fellowship,” Witte says, and the events typically draw nearly 100 older adults as well as younger church members. And, he adds, as more folks get involved in Ageless Generations events, participation also increases in other areas, such as Bible studies, which are now held at least a half-dozen times a week. “The Ageless Generations Ministry Action Team is charged with the responsibility of equipping, empowering, encouraging and engaging the older adults to be active Christians,” Witte explains. The congregation benefits, too, he adds, as retirees also hold seats on the church council, help with the Thanksgiving turkey giveaway, join mission trips to foreign countries and serve during worship as ushers, greeters and Communion assistants. Longtime Lutheran leader, writer, speaker and humorist Dr. Richard “Rich” Bimler believes both church and society are “facing a major issue of ‘climate change’ … of how we depict, relate and minister with and to older adults. Bimler served 12 years as executive director of the Synod’s Board for Youth Services and 13 as president of Wheat Ridge Ministries, and now, at age 78, relishes his role as ambassador of Health, Hope and Aging with Lutheran Church Charities in Northbrook, Ill. Older adults can be “significantly involved” in their congregations’ ministries, says Dr. Rich Bimler, ambassador of Health, Hope and Aging for Lutheran Church Charities, Northbrook, Ill.
Lead the children’s message during worship. Become a mentor to a confirmand. Pray, visit and encourage a newly baptized congregation member. Serve as a foster grandparent to those whose grandparents live out of town or have died. Meet at “St. Arbucks” (Bimler’s nickname for Starbucks) with younger people to listen, share, counsel and offer support — and pay for the coffee, too! Encourage pastors, teachers and other church/school staff by praying with and for them, taking them to lunch, being a friend. Help organize and lead an older-adults group in the congregation. For information on joining a network of older-adult ministry advocates in congregations and links to resources on “celebrating God’s gift of aging,” contact Bimler at rbimler@gmail.com. As director for the Healing Arts at Concordia Lutheran Church in Kirkwood, Mo., nurse Sharon Ema, 59, has been part of the congregation’s older-adult ministry for two decades. They make prayer shawls and pray for specific couples preparing for marriage. The shawls — “large enough to wrap [each couple] when they pray or have devotions together” — are presented to the couples by those who made the shawls, “a wonderful connection,” says Ema. They make cards for homebound members as well as those who are celebrating milestones such as graduations, confirmations and birthdays. 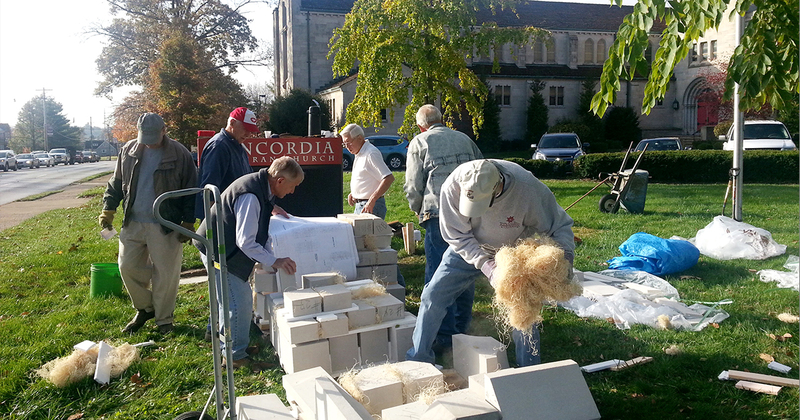 A group of them — with experience as engineers, mason workers, elec-tricians and contractors — replaced the church’s front sign, which involved taking it apart, replacing rough-cut stones, digging holes and trenches, and resetting it.